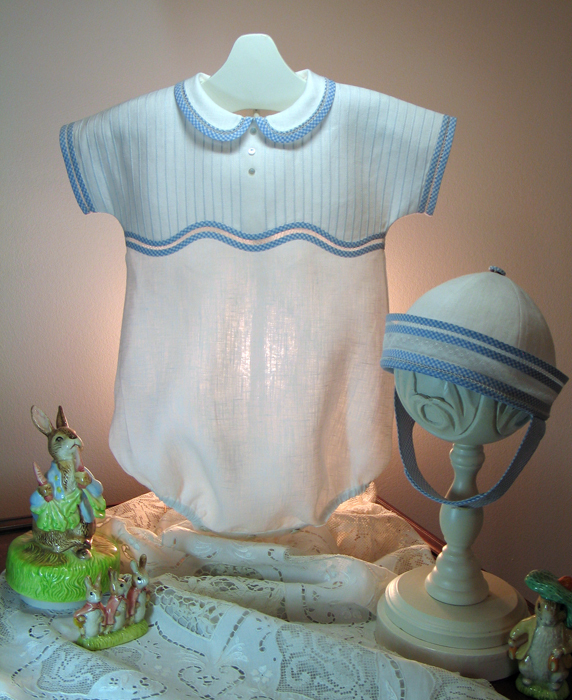 With that in mid Debbie has designed two equally delightful outfits, a precious lace trimmed serpentine yoked dress with puffy pockets and matching bonnet for the Wee Miss and a royal romper (with choice of straight or serpentine yoke) and hat for the Wee Master. Whether sewing for a boy or girl these wee wonders are certain to warm any mother's heart! 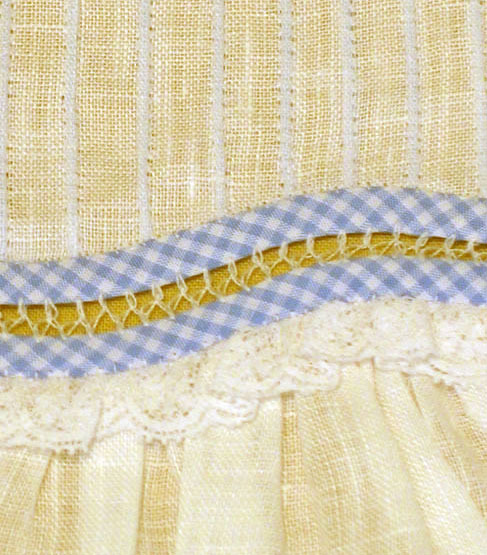 Join Debbie for four days of machine magic and learn how easy it is to recreate turn of the century baby clothes. 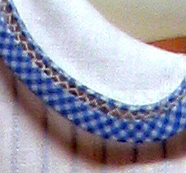 Students learn how to make shadow corded pin tucks, shaped gathers, use faggoting and the blanket stitch to attach bias tubing & lace edging, create a pin stitched serpentine hem, one piece puffy pockets with an embellished flap, and a super simple folded baby placket with no raw edges, plus many more of the “finishing secrets” she uses to make baby garments that are just as beautiful inside as out. 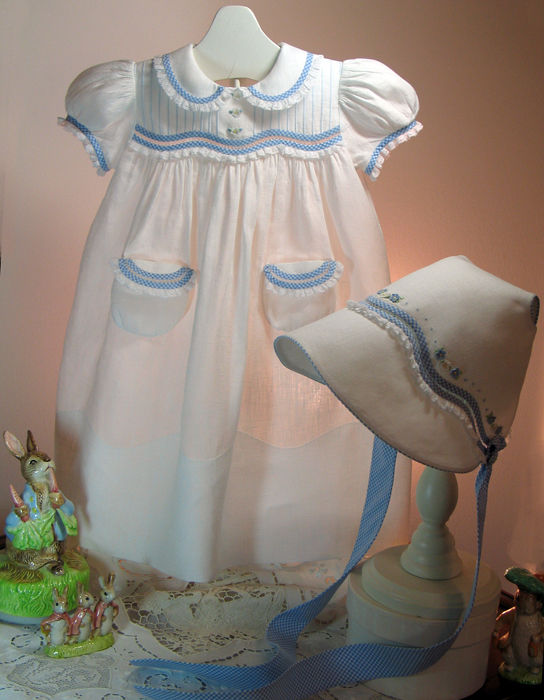 These adorable 1920’s inspired sets are sure to be a cherished addition to baby's wardrobe or grandmother’s hope chest! Price includes all teaching fees, choice of Wee Wonders pattern (Dress & Bonnet or Romper & Hat), full kit, a registration dessert reception with a peak at one of Debbie’s vintage collections, 3 catered in house lunches, 3 dinners in proven favorite local restaurants, Sunday Farewell brunch, optional morning sit n' sews, Aiken bus tour, time to explore to Aiken’s Historical Museum Banksia, Hopeland Gardens, the Thoroughbred Racing Hall of Fame, and Rye Patch Rose Garden, plus a student show and share where you'll have the opportunity to show off your favorite treasures. Price includes all of the above, plus double occupancy accommodations at The Guest House at Houndslake, and a complimentary continental breakfast bar which includes a variety of healthy, delicious foods (coffee, milk, juice, fresh-baked pastries, cereal, seasonal fruit, and yogurt, fresh baked cookies each evening, plus transportation to and from the Augusta GA. Regional Airport (a 45 minute trip). Guests at the lodge will have clubhouse dining privileges and may use the Houndslake Country Club Olympic sized pool; plus the golf course and tennis courts on a space available basis. Please note that students will be responsible for all incidentals and services booked through the Guest House (telephone, massage, pro shop, golf cart charges, etc.) during their stay. We will provide shuttle information for those flying into Atlanta, GA Hartsfield International Airport to the Augusta, GA Regional Airport upon request. All attendees are encouraged to stay at The Guest House where the retreat is being held. We will provide name and contact information for those interested in locating roommates, but accept no liability for such arrangements. Please register by phone at 803-642-1852, on line by sending completed registration form to debbie@loveandstitches.com, or mail a printed form to Debbie Glenn at 14 Cherry Hills Drive, Aiken, SC 29803. Please note space is limited to 10-14 students; so classes are expected to fill quickly. A $400 deposit is required to confirm booking and must be received by Aug 15th. The balance is due by Oct, 1 2011. A block of rooms at The Guest House has already been booked so there is no need to personally contact the Houndslake Country Club. Please be sure to indicate your housing preferences on the registration form, as accommodations are limited and must be confirmed by Sept 1st. Cancellations before Aug 15, 2011 refunded class fee (minus $100 registration fee). No refunds will be issued after Aug 15th, unless the retreat is canceled by the instructor due to insufficient participation. In such an event, students will be notified by Sept 16th and a full refund issued. Please do not book flights prior to receiving confirmation- as students are personally responsible for the cost of all travel plans. I would like roommate information. I am NOT able to climb stairs without assistance. I am traveling with my spouse. I am flying and will need airport transportation but flights are not booked yet. Confirmation registration note will be sent on receipt of your deposit and this form.